Dedicated volunteers worked with the Kenedy Animal ControlOfficer to get the City's very first adoption program up and running. They have a Facebook page with pictures of adoptable dogs. There are several that need homes ASAP. You can help by donating, fostering or adopting, and sharing the dog's Facebook links on your social media pages. You never know who may see a dog and want to help. Shocking photos appeared on Facebook today and are quickly spreading over the internet. 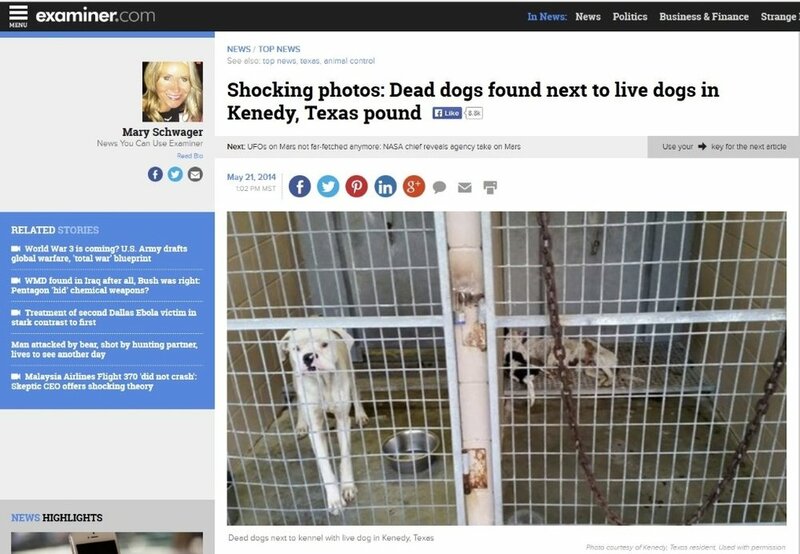 The pictures show what appears to be two dead dogs in a kennel next to a live dog in the Kenedy, Texas animal control facility. Social media posters are pleading people reach out to the City of Kenedy to try and help the shelter because they say other pictures show dogs that appear malnourished and not well taken care of. This author tracked down the people who took the photos, they wish to remain anonymous, but gave permission to use their photographs in this article. One of the picture takers said the smell at the facility and the conditions are horrible. "I happened to go by there and saw the dogs and saw dogs laying in a pile next live dogs. It was very bad, the stench, it shouldn’t be like that. The dogs you can tell are malnourished." Kenedy's City Manager, Ford Patton, didn't seem to be aware of the situation when this author contacted him this morning and is looking into it. Patton also said there’s no active marketing program for dogs that come into the city pound, no one posts pictures of animals who need homes on their website because the City doesn't have a website. "We try to get word out, we don’t have the staff or resources to do any extended outreach program. If they’re not adopted they're put to sleep." Volunteers in Kenedy tell this author they are trying to work with the City to develop a program to advertise dogs that end up in the pound, so they have a better chance at being adopted, including helping to build a website to market the dogs. If you would like to assist with their efforts, please email this author who will put you in touch with them. UPDATE: May 27, 2014: Since the initial conversation, City Manager, Ford Patton, has not returned any of this author's calls or emails about what transpired at the pound or what changes may occur in the future. Today this author called Patton again and left him a voice mail saying more than a dozen people have offered to help, he has not responded. Volunteers are struggling to get a grassroots effort started and created a Facebook page called, "Kenedy Animal Shelter Dogs". They especially need people who live near Kenedy to volunteer to help care for the animals, take pictures and create write up's about the dogs to post on social media. They hope increased visibility and marketing of the pooches will help get them foster and adoptive homes. The organizers behind this effort are also looking for someone to help them with the paperwork and ongoing requirements to set up a nonprofit organization so they can raise money to help the dogs. A volunteer led adoption program is now underway. Today volunteers posted this very first photo album of dogsthat are at the Kenedy municipal pound and need homes. The Facebook page contains pictures, ages and descriptions of the pooches. Volunteers say people to foster or adopt the dogs as soon as possible, as they are at risk of being euthanized. Contact information on how to apply is in the album. If you live out of state and are interested in adopting there are animal transport services that run out of Texas to many places across the country. Also today a San Antonio television station broadcast this story about the Kenedy shelter.